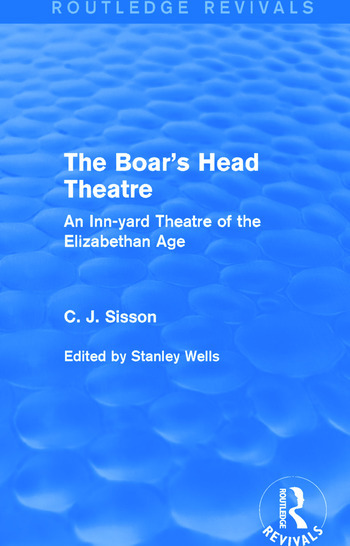 The Boar’s Head Theatre, first published in 1972, provides an account of one of the Elizabethan inn-yard theatres. It is a reconstruction of considerable importance in our understanding of the performance conditions affecting Elizabethan drama, the mode of presentation and the nature of the audience. C. J. Sisson (1885-1966) was known especially for his research into Elizabethan court cases and the light they can throw on the literature and drama of the period. His discoveries included material on the Elizabethan inn-yard theatres which provides unquestionable evidence of great importance in relation to the evolution of the theatre in England. This book, which has been edited for publication by Stanley Wells, was to have been his major work on the subject. Historians of the theatre of this period will find this book indispensable, and those with a more general interest in the greatest age of English drama will be engrossed by the detailed and intimate glimpses of the theatre world which this story affords.